Shortly at the beginning of Summer 2011, McDonald's started promoting their new Yuja McFlurry flavour. Before I knew what a Yuja was I assumed it was like a lemon, and when I suggested to my girlfriend to try the new 'Lemon McFlurry', she pretty much called me an idiot for confusing a Yuja for a lemon. Rather than explaining what a Yuja is, or its many used, you can just check out the wikipedia article about it here, but in most places outside Korea it's called Yuzu, as it is in Chinese. Like most McDonald's promotional posters in Korea, they did not provide an English translation, nor the price. I guess as most Koreans could care less about the amount they pay for things (explaining 200USD/kg beef), the lack of a stated price makes a little more sense. I've had traditional Korean Yuja tea before, and I've always found it too sweet for my liking, as I prefer hot drinks to be served sugar-free and strong. 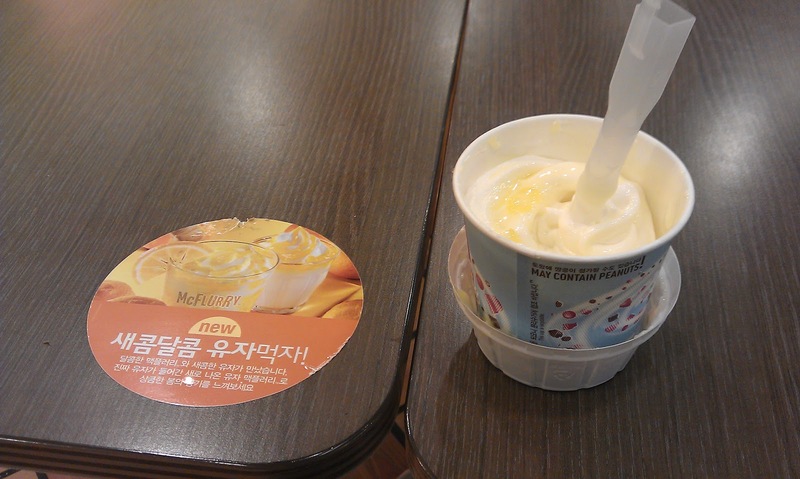 The McDonald's attempt of the Yuja McFlurry was overly sweet, as did not use the Korean tea mix, but rather a flavoured and sweetened jelly mix with pieces of the actual fruit mixed in. The first time we bought it we found that they didn't use much of the flavouring at all, probably about a spoon full, not nearly enough to coat the entire ice cream. Our second attempt at ordering it few weeks later came with the same result. I guess with Korean fruit prices being one of the highest in the world they couldn't afford to use the real fruit in their McFlurry, and it was discontinued by McDonald's about a month and a half later. The taste never worked, and I never saw anyone else ever order it. They really do need to bring back the Green Tea McFlurry, asap, people actually enjoyed those.